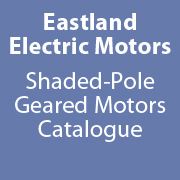 AC shaded-pole motors are available in external and internal rotor designs. This type of motor, with its two-pole construction, features a simple, robust and maintenance-free design. They are used primarily in low-torque applications. These motors have only one winding, no capacitor nor starting switch, making them economical and reliable.